The Staff Selection Commission, Government of India has declared tentative recruitment schedule for different position to be filled in the year 2016-17 through different exams including SSC-CGL and SSC-CHSL. 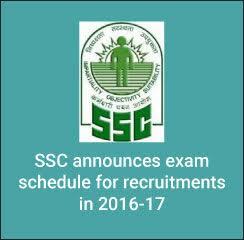 The SSC recruitment 2016-17 calendar consists of name of the examinations, their application start and closing dates and dates of examinations. Candidates who wish to appear in exams like CGL, JE, CHS, Engineer, Clerk, Stenographer and Translator examinations can check below for important dates for SSC recruitments. Staff Selection Commission undertakes recruitment to all Group B, C, D posts in the various Ministries/Departments of the Govt. of India and their attached and subordinate offices. Along with that, it also recruits all non-technical Group “C” posts in the various Ministries/Departments of the Govt. of India and their attached and subordinate offices. As per the official notification, SSC CGL 2016 Tier-II will be held in a three-day window from November 30 to December 2, 2016 in a computer based mode. The tier-I Exam for SSC_CGL has already been conducted. While, SSC JE (Civil, Electrical and Mechanical) 2016 (Paper -1) will be held on December 8, 9 and 12, 2016 in an online mode and SSC CHSL 2016 Tier 1 will be held from January 7 to February 5, 2017. Check below for the detailed examination schedule of SSC for the year 2016-17. The detailed advertisement for each exam will be announced separately. Candidates are advised to visit www.competition.careers360.com regularly for latest news and updates.